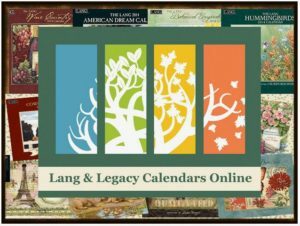 2019 Lang, Legacy and Pine Ridge Calendars have been ordered and are due to arrive in July/August, 2018. These calendars stand the test of time, with quality linen embossed paper and exceptional artwork, you won’t find better anywhere else. They open up to a large sized calendar, and have lovley large calendar number boxes, just for writing in those important dates. The majority of people also buy the Calendar Frames, which allow you to proudly show off each and every month artwork and still use as a calendar. So click on the “Shop for Calendars” in the menu and look at all of the lovely designs available. To see more detail, click on the image and another page will open with all of the images for the 12 months and more information. All communication and shipping is done by our sister site Somethings Country.